I recently read a blog post by Everett Bogue called How to Live with 50 Things. It is a great piece about extreme minimalism. I am not interested in only owning 50 things (yet), but it made me think, at the very least, I should be carrying less in my purse. When I thought about the fact that some women carry more in their purse, than some minimalists own, I found one of my smallest purses and got to work downsizing. The message from Everett’s post that really made me think about how great it would be to carry less was, “When you have 50 things there is no way to lose things. I’m convinced that once we pass 150 things our minds can no longer pinpoint the exact location of all our individual possessions.” If you’ve ever lost your cell phone, raise your hand. How about a pen? Business cards? Lipstick? Now, how many times were those items actually in your black hole of a purse the entire time you thought they were lost? 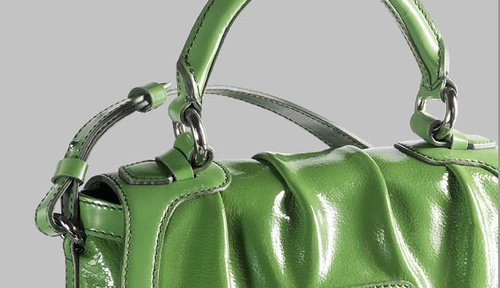 There is an actual Flickr Group dedicated to images of purse contents and it’s not pretty! Purses get bigger and bigger and we always fill them to the brim. The size of your purse seems to determine the amount of stuff you feel compelled to carry around. For me, it’s not even something I do on purpose. I could carry a larger purse with just a few items, and before you know it, the kitchen sink is in my purse. When I am too busy to think straight, my purse is typically a hot mess. It’s a sign! I know situations differ depending on your career or how many children you have, or if you are traveling, but there are great benefits to carrying less. A smaller purse with fewer contents will not physically weigh you down. Carrying less means less to lose by theft, or accidentally leaving your purse behind. You don’t have to search for your car keys in a small purse. If your cell phone is ringing, from your purse, you can turn it off or answer the call with less distraction. You will feel lighter when you not responsible for carrying around everything that you think you might need. Last week, I challenged myself to only carry 10 items in my purse and I never missed a thing. Here are the 10 items that I carried this week and I could easily drop items 4,5, 7 & 8. They are a luxury! It all comes back to feeling like you have enough. When you start to believe you have enough and that you are enough, you can lighten up and let go of the stuff. So ladies, what would you carry in your ten item purse? What is the silliest item that you carry now and never use, but keep “just in case”? Men – you are not off the hook. If you carry a briefcase, backpack or wallet, could you carry less? I also read Everett’s post and left him a comment. I can’t ever see myself living with 50 or 75 things, but I do think I could live with ALOT less than I have right now. I also think I could carry 1 lipstick instead of 9 in my purse! Angela…I can relate! I used to carry a special purse in my purse just for multiple lipstick/gloss. Sometimes clutter happens where you least expect it. I dislike carrying large purses. My normal purse contents are chapstick, wallet, keys, pencil. Lately I’ve ADDED miniature bottles of lotion and hand sanitizer. My problem comes from always carrying a knitting project with me! Willow, I actually keep a bottle of hand sanitizer in the little pocket on my lower driver’s side door of my car. I try to use it as I come out of meetings and stores! This made me smile. My handbag (I’m English!!) is stuffed full of rubbish, I always have my purse, phone, keys, a book or two, a notpad and pen, my make up bag, often notes of my current project, diary……..and a million and one other things. Every so often I swap bags and just move the essentials but the junk seems to recollect very quickly. I am inspired and am going to chuck everything which is not absolutely essential. Thanks for the note Kate. I would love to hear what you end up keeping as essential. I have had to be careful that I don’t make my car a little extension of my “handbag”! It is tempting to throw all the little stuff that would normally accumulate there, in my center console. I also need to let go of the notion that the actual purse is anything more than something to carry stuff in. It seems the outside fashion can become as important as the inside contents. I get a little googley-eyed when I walk by a Louis Vuitton store but spending hundreds or thousands on “bag” doesn’t really fit the be more with less lifestyle! My purse just has my wallet, the cell phone (if I remember it, which I often don’t), my keys, and a shopping list if I’m going to the grocery store. I also keep a cloth bag that I made out of a tank top in my purse, it’s great for quick trips to the store so that I never need to get a plastic bag when I check out. It’s easy to transfer the contents of my purse to the top pocket of the diaper bag if I’m going somewhere with our son, as I only keep a few things in my purse anyway. Much better than the days when I had it jam-packed with stuff! It’s amazing how the contents of a handbag (I’m English too!) seem to multiply. I clear mine out when the seasons change, or when I want to use a different bag for a while. But often I put most of the same stuff back in the new bag. My daughters have a mantra when they are leaving the house – “glasses, money, phone”. These are what they consider vital and irreplaceable. I would add keys to this list, and tickets if I’m taking a train or going to the theatre, but it shows how little we really need when we get right down to it. Thanks for the reminder to keep that lovely bag I drag everywhere with me, nice and neat and clean and easy to sift through! Love it! Thanks for the great list Susan. I’ve hated purses and handbags since I first started “having” to carry them — and I am 68 years old. It’s like having to carry a piece of luggage around with you. I’ve always gone by a rule that a great aunt gave me, years ago. If you need to carry makeup in order to repair your makeup during the day, you’re wearing too much. When I worked, I did keep a small makeup kit in my desk…but I refuse to schlepp it around in my handbag. Keys, cell phone, ID/credit card, glasses/container. My cell phone has a notepad — so I don’t need a pen or a pad of paper. Also has a Kindle app, so no need to stuff in a paperback to read while waiting for whatever. The small leather bag I carry has a built in credit card slots, change purse and bill compartment, so no separate wallet. It’s only 10″ by 7″ by 2″ but I still would rather not carry even that small bag. thermometer (believe it or not I have needed/used this more than a few times), multiple pens and pencils. Wow, I originally thought I’d do great on this one, but I’ve got way more stuff in my small purse than I imagined. No wonder it’s so heavy. Guess it’s time to look at this challenge more closely. Hi Courtney. Have you still been able to keep it down to just these few items? I’d love to hear what you think I could get rid of 🙂 Loving your site! The silliest item I carry now and never use but keep in my purse just in case are earbuds in a case for my smartphone. After reading several books and a few blogs on minimalism, I downsized to my one black Baggallini so that it goes with everything in my wardrobe (only black, white, khaki). It can be a wristlet, shoulder, or cross-body bag, and it’s very, very lightweight. Simplifying is a satisfying work in progress. Just found this blog and I’m checking out all the archives. I just had to comment on the purse issue! I never carry one. I keep my license and money/credit card in my pocket. If I don’t have a pocket, I keep them in the side of my bra, since my budge is reserved for my one essential lipstick. Admittedly, it can be a bit tricky when I have to pay for something but I’m somewhat of an expert at it, since I’ve been doing it for years. The freedom is worth it – I can’t imagine having to bother with a purse! I’m enjoying your blog, keep up the good work! I could still fit lots more without stuffing my large purse, but im not sure what other household items i could put. Ideas? I have come to the realization I have a love – hate relationship with purses. One day I had my favorite bag with me, in the front of the grocery cart, I was hands free as my son pushed the cart…it was exhilarating. ..since then, I slide my tiny card wallet into my bra, hang my keys and lip gloss on a lanyard, and carry my phone…free bird and loving it. This is a very insteresting post. It got me thinking all the items I carry in my purse and how important it all is. So, OK here it is! For work, Monday-Friday, I carry a tote-size leather bag. Everything I need it’s in there, so here’s the breakdown. 3. My sunglasses (in a sunglasses case). On the weekends when I go out to dinner or the movies, I carry a wristlet or clutch with just the essentials for that evening; money, debit card, ID, iPhone, and lipgloss. My keys have been on a clip for years and I hang them, along with the purse, from my belt loop/ waste our bra strap when shopping, etc. Hands free!